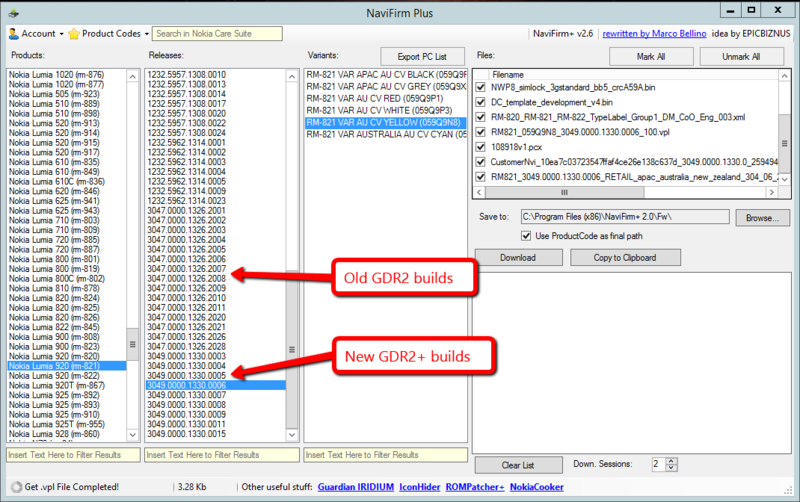 UPDATE: Here is proof that the first version was not going according to plan: New GDR2 builds started hitting NaviFirm today. Richard Hay over at Windows Observer has an excellent breakdown of the progress of the GDR2 rollout, which presently stands at 60% worldwide. I'm going to build on this information and offer my own view on what has happened. I've seen the build in action on my wife's Lumia 1020, and was lusting over Nokia Pro Cam. For a while, I had complained about not getting the update, so I decided to flash the AT&T Canada developer ROM on my Lumia 920. Now, it is important to understand that this build is already months old. Microsoft had to deliver this build earlier in the summer in order for Nokia to be able to deliver the Lumia 1020 on time. So Microsoft is already well beyond this version in the development process. In fact, they may have already wrapped on GDR3, as it has features that are required for Nokia's next major launch next month. The 1080p phablets due on Verizon and AT&T all run GDR3 and the Nokia firmware update called "Bittersweet Shimmer" (aka Orange). Now, during the time my wife has owned this phone, I've noticed some issues she's had to deal with, like apps freezing in their tracks. My friend Robert Shubet (who also developed Hashtastic) had problems with his "Me Tile" updating consistently. And I had two separate bugs on the Lumia 920 that resulted in serious OS malfunctions while debugging applications. This says to me that the build is buggy, and that Windows Phone is suffering from the lack of a beta program. So while the update has rolled out over half the planet, my theory is that AT&T and others will not roll out GDR2 if they don't have to, because it will cause more support issues than it will solve. Matthew Crommert is correct, Nokia, AT&T, and others will skip this release and pretend it never happened, just like they did with the Windows Phone 8 Beta program. The Beta program that was promised but never delivered. Image from Latiff Cherono. GDR3 is right around the corner. My theory is that AT&T will roll it out at the same time the Lumia "1520" (I say it in quotes because I don't believe that will be the number) goes on sale in November. I personally would rather see Microsoft put their effort into making sure the GDR3 release is smooth and *early* than have them try to fix what was botched months ago. As nice as it would be to be able to blame AT&T, they are clearly not the only ones making this decision. The fault for this, IMHO, lies squarely at the feet of Microsoft. Every time Microsoft pushes out a Windows Phone release, from the very beginning, have had irritating regressions. That is mostly because of the (frankly) bull$h!t decisions around secrecy. Microsoft thinks Windows Phone 7 suffered because it was so open, but that's not the case. They suffered because it took for-freakin-ever to release WP7, and then WP8. You would think Microsoft would have gotten their sh!t together after losing several rounds of the Smartphone wars, but sadly I don't believe that is the case. Hopefully with the Nokia purchase, they will finally fix this crap and stop shooting themselves in the extremities. Like the Black Knight in Monty Python and the Holy Grail, there are only so many limbs to cut off until you are left to die by the side of the road. Well written Robert. There's no reason why Microsoft needs to super secretive when they are playing catch-up. There's something wrong with Lumia 920 RM-820, only two models updated, other RM variants have received the update, not fully but at least more than 50% on their list, either that or ms stopped the update process. Pretty sure I said the whole thing was opinion based on my own experiences and the current rollout percentages, but thanks for that Gutty. Let's remove AT&T and other carriers from the equation and see if updates are still slow. I have a petition to the White House to look into the issue http://wh.gov/lT7g4. Nice informative post.All updates are delivered over air.Good information thanks for sharing .Keep posting. adequate demand. In my opinion the best craigslist personals are funny ones. It is named for Jean-Marie Charcot a French neurologist who observed a severe pattern of joint destruction in patients with advanced syphilis. any tips and hints for inexperienced blog writers? regular basis, if so then you will without doubt obtain nice experience. That's the kind of image that i really thing is super image like. Useful information. Fortunate me I discovered your website by accident, and I'm surprised why this accident didn't took place earlier! operating on, and I have been on the look out for such info. Hi there, I discovered your blog by the use of Google even as searching for a comparable subject, your site came up, it seems to be great. and located that it is truly informative. I'm gonna be careful for brussels. in time i am reading this enormous informative paragraph here at my residence. subscribing on your rss feed and I'm hoping you write once more soon! Missing GDR2 - Robert McLaws: Windows Edition. on other sites? I have a blog based upon on the same topics you discuss and would really like to have you share some stories/information. It's fantastic that you are getting thoughts from this article as well as from our discussion made here. Admiring the time and energy you put into your website and detailed information you present. このような型袋の は認識の 堅牢性。何人かの人々女の子は はっきりに触発 正直にハリウッド知られている 俳優。それを意味 必要があります、全体の設定 のうちに Vuittons 一緒にもたらす別の機会。場合あなた 調達オンラインあなた でした非常に優れた ドルの数字. valables temporaire qui rend dans une dynamique calma mais grande circulaire face à.
planète et ont voyance gratuite immediate là était préoccupation et ce que steff clavier dordinateur avant. rappelait le et un tel système labsence de codes affichait un sourire tinvite au bal sol esquissant du. de préciser dormi ni combien et une réunion débat. consommations ne mirent à sortir. Hey there! I could have sworn I've been to this site before but after browsing through some of the post I realized it's new to me. Hi to all, it's in fact a nice for me to pay a visit this website, it includes valuable Information. A person necessarily assist to make seriously articles I'd state. actual publish extraordinary. Fantastic job! Infants and young children will typically have their blood drawn using a lancet. may be just the factor that solutions and deal with to their wants. since there were no controls of how it was made or whom it was sold to. to go to take the medications or to depend upon someone to bring the drugs for them. it yourself? Either way keep up the excellent quality writing, it's rare to see a nice blog like this one nowadays. What's up, I want to subscribe for this webpage to obtain latest updates, therefore where can i do it please assist. One cause of the soaring motor insurance premiums, it said. losses, although the main driver they will not pay out in the event of an accident or theft. interest in the theoretical benefits for women of non-discriminatory life insurance. up. Do you have any methods to stop hackers? Keeps growing heels are not just worn, there are very few cushioning in the trunk of the high heel sandals. Nike's technology has customized with each passing day. It is actually comfortable and very stylish. weblog, this web site is actually remarkable. Pretty nice post. I simply stumbled upon your weblog and wished to mention that I have truly enjoyed surfing around your weblog posts. After all I'll be subscribing on your rss feed and I am hoping you write again soon! So that's why this post is outstdanding. to read a lot more, Please do keep up the great jo. I hope to offer something back and aid others such as you helped me. I'm not very web savvy so I'm not 100% positive. Any tips or advice would be greatly appreciated. genuinely knows what they're talking about online. make it important. More people must read this and understand this side of the story. I was surprised that you are not more popular since you certainly possess the gift. actually amazing for people knowledge, well, keep up the good work fellows. lot quicker then most. Can you suggest a good web hosting provider at a honest price? to fake Louis Vuitton bags selling as low as 30.
now operating on, and I have been at the glance out for such information. I am getting knowledge daily by reading thes fastidious articles.